Bulk/Tote Filling System | High Performance Solution | ROBOVIC Inc.
Robovic offers a complete range of filling systems adapting to speed and work force required for your operations. The tote filling systems are solutions that execute filling ergonomically and efficiently at the level of automation desired. The multiple projects executed by Robovic have resulted in high-quality expertise to develop tote filling systems with the most explicit precision. – The THS model, completely automatic, where bag placing and or filling is robotic , closing bag and placing on pallet are automated and completely autonomous. – The semi-automatic model, that requires an operator to hook and close bags. 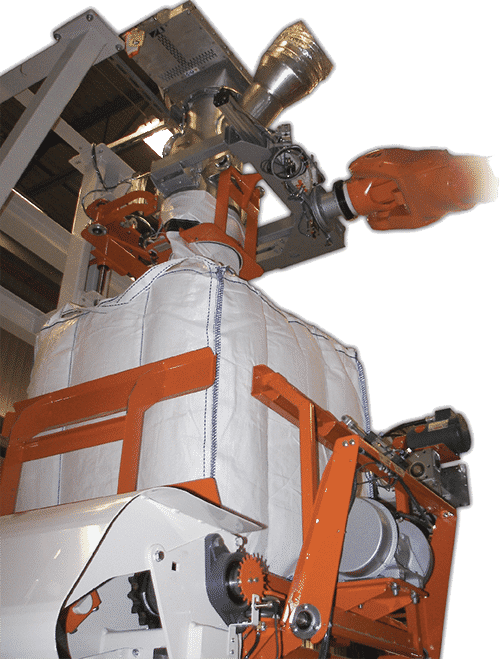 The difference between the semi-automatic tote filling system and the full automatic resides in the picking up of the bag directly from a pile. The bags thus stacked on top of one another on the pallet therefore retain their competitive prices despite their functionality dedicated to automation. The maximum speed for the fully automated tote filling system is 55 totes per hour and 15 totes per hour for the semi-automatic model. These stations are optimized to fill bags of 500 to 2000 kg, a sequence of movements and vibrations helps to distribute the product in order to provide maximum stability once filled. We offer different options for our bulk/tote filling systems such as wrapping and tagging as well as a manipulator to place 1 to 4 bags on a pallet. The tote filling systems are built with extremely resistant and durable components. Whatever your needs, Robovic can supply perfectly integrated solutions, offering the possibility to connect to your computer system or AGV.